Creative Medical ID Alert Bracelets and stylish jewelry custom engraved for men, women, children - Crystal medical id interchangeable bracelet, no tag. A marriage of glamour, simple elegance and a pop of color make this a great everyday design. 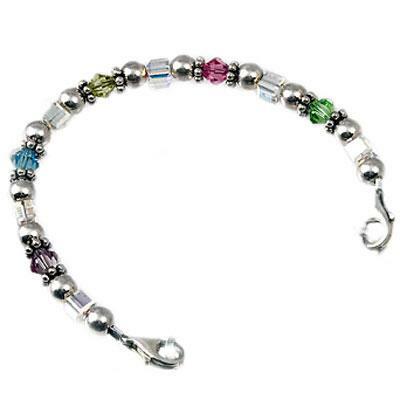 This style features multi-color 5m bicone Swarovski crystal colors laced with 5mm swarovski clear ab crystal cubes, sterling silver rounds & stations of bali silver dotted spacers! The number of crystals may vary due to bracelet size ordered.